Broadstairs dish - 11½" (292 mm) wide, 10½" (266 mm) deep. 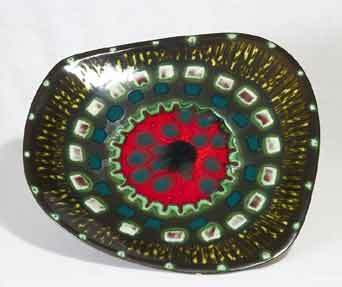 David White started Thanet Pottery in Westwood near Margate, Kent with his sister Mary in 1961. The company was successful, but had to close in 1967. His next venture was Broadstairs Pottery a few miles along the Kent coast. He ran it from 1968 to 1983, when he sold it so that he could concentrate on one-off studio pieces. He worked in porcelain and mainly used blended glazes producing a crackle effect. The pots, when they were taken from the kiln, were rubbed with carbon-based ink which was immediately washed off. This produced a reticulated pattern. David made careful notes at each glaze firing so that different effects could be accurately reproduced. He passed away in December, 2011. He works in porcelain and mainly uses blended glazes producing a crackle effect. The pots, when they are taken from the kiln, are rubbed with carbon-based ink which is immediately washed off. This produces a reticulated pattern. David makes careful notes at each glaze firing so that different effects can be accurately reproduced.